While Apple executives have continued to call the Apple TV a hobby, over the past couple years, the company has dedicated a fair amount of resources to it. The Apple TV 2 was a major upgrade, and Apple has added a good number of features to that media player through software updates. The third-generation Apple TV unveiled Wednesday shows Apple is taking its hobby just a little bit more seriously, thanks to improved video support and an overhauled interface. But there are still plenty of questions about the latest edition. Here’s what we know so far. What’s new about it? Does it finally do 1080p? The new Apple TV looks exactly like its predecessor, and is housed in the same tiny, black enclosure. The big hardware change for the new the Apple TV is inside: Instead of the Apple A4 chip found in the previous Apple TV, the new model hosts a single-core A5 chip. The improved horsepower finally allows the Apple TV to support 1080p video output. On the software side, there’s a new user interface with large, iOS-like buttons instead of textual menus for the major content categories. There’s also a new Genius feature that suggests movies based on movies you’ve already watched, and Photo Stream images are pushed to your Apple TV without any manual intervention. 1080p sounds very cool, but I don’t have a very fast Internet connection. It’s going to take me forever to download a 1080p video! Fear not, for with the latest Apple TV software update, the Apple TV’s Settings screen lets you choose the resolution of your video downloads: 1080p, 720p, or standard definition. Apple recommends a broadband connection of at least 8 Mbps to comfortably download 1080p content. If you have a slower connection, you’ll want to choose 720p or standard definition. iTunes 10.6, released Wednesday, has a similar Prefered Video Version option that lets you choose from High Definition (1080p), High Definition (720p), and Standard Definition. Given that the Apple TV is running a version of iOS, can I finally run apps on it? Unfortunately, no. The new Apple TV provides largely the same features and content options as its predecessor, just with a new interface. Has Apple added any more “channels” or media options? Can I finally stream video from Hulu or Amazon Video, or audio from Pandora? However, a new feature automatically pushes new iCloud photos to your Apple TV for immediate viewing. 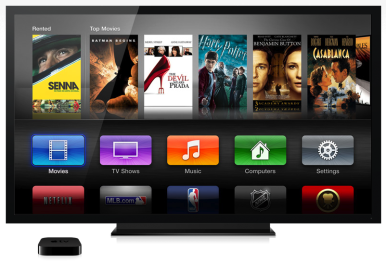 Can you buy TV shows or movies from the Apple TV? Provided you have an iCloud account, you can purchase TV shows and movies directly from the Apple TV—and later download and watch them on your other iCloud-enabled devices, as well. Has anything changed in terms of movie rentals? Do you still get only 24 hours to watch a rented video? How much does it cost to rent TV shows and movies? Apple hasn’t announced any changes to rental terms. 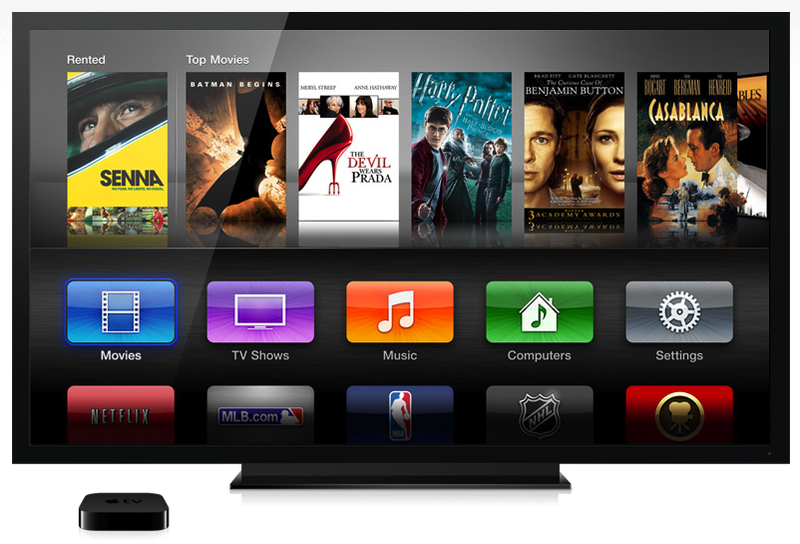 Can you still buy movies and TV shows in iTunes and then play them on the Apple TV? What about ripping your own movies and playing them from iTunes on your computer? However, there’s a catch here: You still can’t re-download movies from Fox and Universal, thanks to pre-existing deals those studios have with Time Warner. As for ripped movies, the answer is the same as with the second-generation Apple TV: If you can get a movie into iTunes, and it’s in a supported format, the new Apple TV can stream it over your local network for playback. As with the previous Apple TV, content availability and terms vary depending on the country. Similarly, depending where you live, your iCloud and iTunes Match features may differ from those in the U.S.
Will the 2010 Apple TV support the new features via a software update? The 2010 Apple TV (which Apple calls the second-generation model) will get the new user interface via a free software update. However, the older model won’t gain support for 1080p video, as it doesn’t have the necessary hardware. So what are the supported video and audio formats? In terms of audio support, you can play HE-AAC, AAC, protected AAC, MP3, MP3 variable bit rate, Audible, Apple Lossless, AIFF, and WAV files; the Apple TV also supports Dolby Digital 5.1 pass-through. What kinds of connections does the new model have? As with the previous model, the new Apple TV sports an HDMI output for digital audio and video, a Toslink-optical output for digital audio, a 10/100Base-T ethernet port—sorry, no Gigabit ethernet yet—a Micro-USB port for service use, an infrared receiver for the included remote, and 802.11a/b/g/n for wireless networking. Can I connect an external hard drive to the Apple TV? As with the previous two Apple TV models, the USB port on the back is designed for only “service and support.” Products such as ATVFlash have been able to use the Apple TV’s USB port to allow for things like external hard drive storage and more media features, but these are unsupported additions. 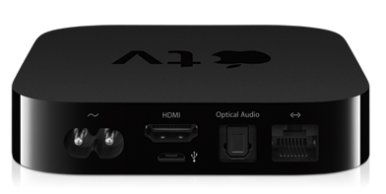 Given the similarities between the new Apple TV and the second-generation model, we suspect the current version of ATVFlash either works with the new Apple TV or will quickly be updated for it. Has AirPlay changed at all? AirPlay functionality appears to be the same as with the previous Apple TV: You can stream music, photos, and videos to the Apple TV from AirPlay-enabled apps on your computers or iOS devices. If you have an iPhone 4S or iPad 2, you can also use AirPlay to mirror that device’s display to the Apple TV. Despite rumors of a new remote design, the new Apple TV comes with the same basic, infrared Apple Remote as before—a remote that feels more and more limiting as Apple adds functionality to the Apple TV. Thankfully, if you’ve got an iOS device, you can use Apple’s Remote app instead. The updated Apple TV will keep the same $99 price as the previous version. Apple says the new model will be available on March 16, with pre-orders starting today. Updated 3/9/2012, 9:43am, to correct a reference to the iPad 2's processor.